with information from the A.P. and other sources. Paraffin oil is colorless, odorless, and smokeless, and looks exactly like water. It produces a nice even flame; the perfect fuel for Shabbos lamps. It also is a poison that can be deadly. According to a study by several pediatric doctors, the risk of paraffin oil poisoning is about 370 times greater in the orthodox Jewish community, as compared to the general public, due to the simple fact that orthodox Jews use the oil much more frequently. During the three years of the study, which was conducted in New York, out of a total of 45 cases of oil poisoning, 32 cases involved orthodox Jewish children, usually under the age of 2, with 9 cases uncertain what religion, and only 4 cases involving definite non-orthodox children. The study was published in the April 2004 issue of the journal "Pediatrics". Most parents keep the bottles of paraffin oil locked away under the sink. In addition, the bottles usually come with a safety cap that makes opening the bottle difficult even for adults, however according to this study, it would seem that many cases of the poisoning involved children actually drinking the oil from the unlit lamps that have been filled with the liquid. 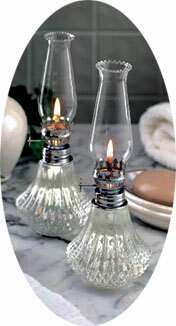 The lamps have a glass or metal tube that holds or serves as a wick. "When the lamp is not lit, the tube looks like a perfect straw to a child," said Dr. Robert J. Hoffman of Manhattan's Beth Israel Medical Center, who led the study. Dr. Hoffman noticed that on many Fridays when he worked for the city's Poison Control Center, urgent calls came in for children who had swallowed the oil. "It turned out they were Jewish," Dr. Hoffman said, "and the accident often happened during Sabbath,"
In addition to the lamp itself, the plastic nozzle some containers have from which the oil is poured poses an equal danger of being mistaken for or used as a straw. Although none of the children died from ingesting the oil during the study, death is possible (Chas Vishalom). Most of the children studied had to receive medical treatment, and one little girl had to be put on a respirator for several weeks. Ingestion of paraffin oil can trigger coughing, vomiting, inflammation of the lungs and lethargy, according to Dr. Hoffman. In addition, swallowing the liquid, or especially vomiting it can cause the oil to be aspirated into the lungs, causing pulmonary injury, according to the label on a bottle of paraffin oil made by Hollowick® Inc.
Hatzolah suggests that all bottles of paraffin oil be stored in a locked cabinet or another place young children cannot get to, with the safety cap on the bottle secured. In addition, all lamps containing the oil should be kept in places where children can not get to them, with the chimney or top in place, to lessen the risk of children getting to the liquid. All children should be warned of the danger of paraffin oil. If you use a cup to fill the lamps with paraffin oil, make sure you empty the cup and rinse it or throw it out, since the oil looks exactly like water. DO NOT leave the cups lying around even for a few minutes. In case the oil is swallowed, immediately call Hatzolah EMS and then poison control. Do not induce vomiting, as doing so can lead to much worse complications. Contains petroleum hydrocarbons (liquid normal paraffin wax). Keep away from children. If swallowed, DO NOT INDUCE VOMITING; call a physician immediately (small amounts of light petroleum hydrocarbon liquids aspirated into the lungs during ingestion or vomiting may cause mild to severe pulmonary injury). Avoid frequent and prolonged contact with skin or eyes. In case of eye contact, flush with cool water. In case of skin contact, wash with soap and water, remove any contaminated clothing. See a physician if irritation persists. Do not fill lamps near flame. Never leave a lamp burning unattended. Store in original container. Do not reuse empty container. Full text of the study by the journal "Pediatrics"